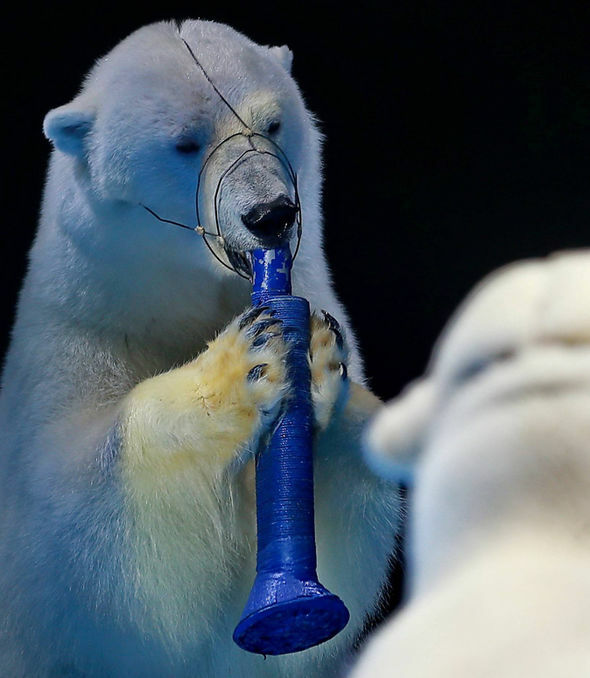 Polar Bear in Muzzle Involuntary Forced to Sing and Dance in Circus act! Sick!!! 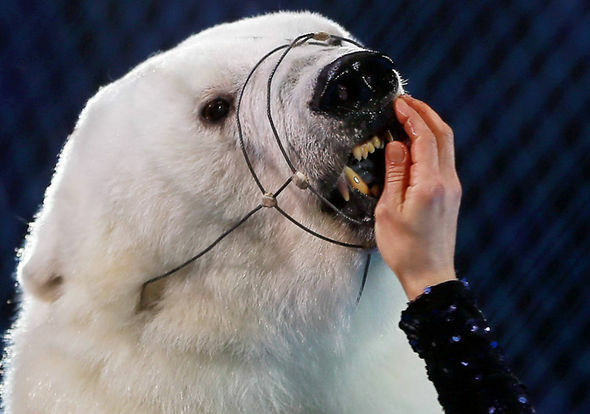 The Ivanovo circus in Russia featured polar bears, whose numbers have dwindled across the world, ‘performing’ during a show under the orders of circus trainers Yulia Denisenko and Yuriy Khokhlov. In one scene, a bear is forced to roar into a microphone while standing on their hind legs – a posture which “is not instinctive” of the animals. Other routines in the bizare performance see the polar bears dance, ice skate and even play football. Animal tamers Denisenko and Khokhlov have become well-known in Russia and Eastern Europe for their travelling polar bear act. 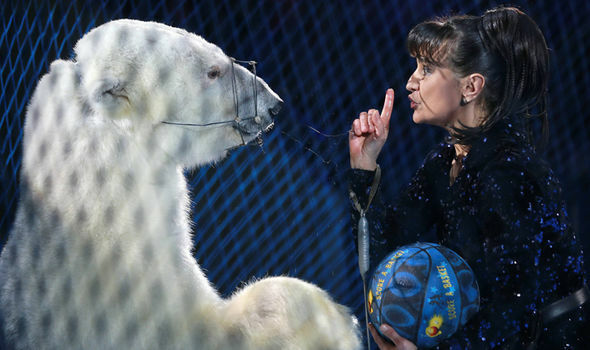 The show featured the famous Bolshoi Circus in Moscow in 2014 and Mrs Denisenko even took her arctic animals to Sochi during the Olympic Games to perform the routine. The experienced animal tamer discussed the often violent regime she implements to train the polar bears, including “breaking” the bears when they are young. She said: “First of all, these animals do not instinctively walk on their hind legs. “And secondly, polar bears are not very gregarious. So it is difficult for them to stay together under artificial conditions. “A predator is a predator and can cause a bad injury just with its paw even when playing. “In nature these animals can easily kill a seal with one blow of their forepaws. “Therefore, it is necessary to give back blow for blow immediately while they are young. The act is billed as the world’s only polar bear ice skate attraction and has already caused outrage among animal lovers. The RSPCA, which campaigns against using wild animals in circuses, said “on average, a polar bear’s enclosure is about one-millionth of the area of its minumum range in the wild”. PETA have previously said: “Polar bears belong in the wild, not in zoo cages nor circuses”. PETA’s Associate Director, Elisa Allen said: “Russia can’t successfully cultivate a remotely progressive image as long as it still abuses bears, forcing these dignified wild animals to perform demeaning and stupid tricks in order to amuse the masses. “We have spoken to trainers for Russian circuses who burn bears with cigarettes, strike them with metal bars and use other torture methods, in addition to forcing cubs to stand on their hind legs by chaining them to a wall so that they will strangle if they attempt to return to a natural all-fours stance. “Many cubs die before the harsh training even begins because of the stress of capture, gruelling transportation conditions, food deprivation, dehydration and extremely rough handling. “The survivors often have the tops of their muzzles pierced with hot needles and a rope threaded through the holes in their septum – they perform under the constant threat of punishment. Russia has a long-standing tradition of training bears to perform tricks such as riding motorcycles, ice skating, and even playing hockey. In 2009, a Russian circus director was mauled to death by a bear forced to ice-skate in a circus routine. The muzzled bear lashed out at his handlers during the Russian State Circus Company’s Bears on Ice show in Kyrgyzstan and dragged Circus director Dmitry Potapov across the ice rink. A witness said the bear “tore his neck and legs to pieces”.